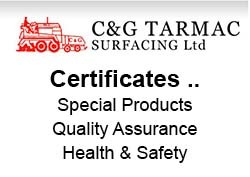 At C&G Tarmac Surfacing Ltd we cater for all your commercial needs from airfields, roads etc. We offer a wide range of services for our commercial customers. We specialise in driveways, paths and drop kerbs for your home. We can take on all size projects including local council work. C & G Tarmac Surfacing Ltd is located on the outskirts of Salisbury ideally situated to serve Wiltshire, Somerset, Dorset, Hampshire, Devon and many more counties across the country. Established in 1988 we have over 20 years' experience in the surfacing industry. Our aim is to provide a high quality service to a wide range of customers, ranging from multi-national contractors, government and local authorities to private / domestic works. We are able to support both commercial and domestic customers with a wide range of surfacing services including road surfacing, car park, industrial sites, schools, forecourts, footpaths, driveways and drop kerbs to name but a few ..... For further details visit our portfolio page. Our new venture includes Machine and Operative hire and machine transportation by our low loader... More details can be found on our Machine Hire and Transportation Page. For any of your Surfacing requirements, Machine Hire or Machine moves we are only a phone call away so why not call us for a free without obligation quotation.